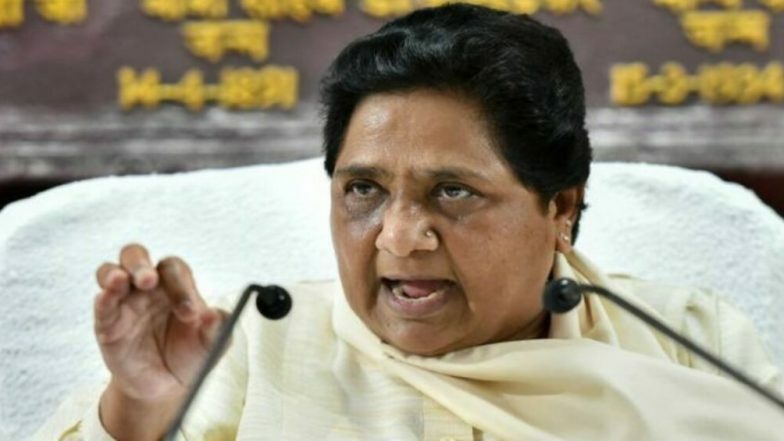 New Delhi, April 15: Bahujan Samaj Party (BSP) chief Mayawati lashed out at the Election Commission for imposing a 48-hour ban on her from campaigning, claiming that her fundamental rights have been violated through a "biased" order of the polling body. The former Uttar Pradesh chief minister categorically denied the charge of delivering a speech which incited voters on communal lines. "EC has given a one-sided decision. I have been denied the fundamental right of freedom of speech and expression. This day will be known as a black day in the history of EC," Mayawati said. Yogi Adityanath, Mayawati Banned From Campaigning by Election Commission For Violating MCC. The BSP supremo claimed that the show cause notice served to her by the Commission, on April 11, did not state that she had prima facie violated the Model Code of Conduct by delivering an inciting speech. On the contrary, she was only charged of reaching out to the electorate on basis of their religion. "EC's show-cause notice on 11 April didn't allege that we delivered an inciting speech, it had only 1 allegation that we were asking for votes on name of 1 particular community," she added. Mayawati further said the EC's action against Yogi Adityanath does not hold much significance as the polling body has "given free hand" to BJP president Amit Shah. "I hope the BSP supporters understand the reason behind the EC's action against me," she said. Mayawati was earlier in the day found guilty by the Commission of violating the Model Code of Conduct, as she had appealed the Muslim community in Deoband to rally behind the SP-BSP-RLD combine, instead of dividing their votes among other parties. The two-day ban, handed over by the EC, would come into effect from tomorrow morning 6am. It would prevent Mayawati to reach out to the voters ahead of the second phase of Lok Sabha elections 2019, scheduled on April 18.